After two years marked by a divisive election campaign, ballot referendums and power shifts, perhaps it's a sign of a return to normalcy that the chief issue that has captured the attention of San Diego politicians so far this year is how well they can work together to keep the Chargers football team in town. Although their effort may end up going nowhere, at least it has pulled city and county officials from both political parties into a united front. The following are how some of the top municipal issues played out during the first half of the year. The year began with the discovery that the Chargers and the Oakland Raiders were in talks to move to the Los Angeles suburb of Carson, where plans are being laid for a gleaming new $1.7 billion stadium, including a 120-foot tower that can shoot lightning bolts when the Chargers score a touchdown. 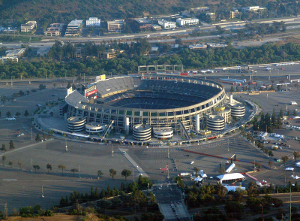 San Diego Mayor Kevin Faulconer responded that one of his top priorities for 2015 would be to put forth a plan for a new stadium to keep the team in Mission Valley. And by May, his handpicked task force managed to produce a plan for a $1.1 billion stadium, albeit with no lightning tower and with a requirement for the Chargers to invest more money than under previous plans. In early June, the Chargers began talking with city and county officials about the proposal behind closed doors. But throughout the entire process, the team has never given any indication that it really wants to stay in San Diego unless taxpayers are willing to cover a large chunk of the stadium costs, which could be a deal-killer. After a decade dominated by budget cutbacks and spending freezes, San Diego is starting to loosen its belt a bit by extending the operating hours of libraries, pools, parks and recreation centers that had previously been cut back; opening or expanding police and fire stations; and making long-delayed repairs to streets, sewers, sidewalks and public buildings. The repairs are daunting. Early this year the city determined it would need to spend $3.9 billion by 2020 just to make needed repairs, far above the $2.2 billion that the city budget is projected to cover. City Hall has been exploring additional means of financing: using unspent funds from the TransNet tax, floating a $120 million bond or making homeowners pay a higher share of sidewalk repair costs, but even those measures don't come close to filling the gap. In the meantime, City Hall has tried been trying to enumerate and prioritize the repairs -- measuring potholes with laser-equipped trucks and mapping sidewalk cracks with teams of college engineering students -- so that it can tackle the worst repairs first. The latest study was completed in early June, finding that roughly a third of the city-owned buildings examined so far -- ranging from public restrooms to lifeguard stations -- are in "poor" condition. After campaigning last year with a slogan about making San Diego "one city," Faulconer has been trying to fulfill that plege by focusing more attention on redeveloping some of the lower-income areas in town. In February, he guided a busload of developers through the Encanto neighborhood, showing them city-owned properties that could be quickly transformed into retail malls or residential tracts just a short drive from downtown. He returned to the same neighborhood to tout his initiative to boost Internet access in city libraries and providing broadband access to families who can't afford it on their own. A mere 19 years after California voters decided to legalize medical marijuana, the San Diego City Council authorized its first pot dispensary in March, with several others in the pipeline (no pun intended). The dispensary had to jump through a series of costly legal hoops to open its doors at a strip mall in Otay Mesa. But after implementing one final series of restrictions, including background checks, a one-year limit on permits and special rules on product labels and interior signage, the City Council finally let the shops go forward in a string of unanimous votes. Perhaps if the dispensaries had been brewing the marijuana leaves into craft beer they might have gotten their permits faster, since that seems to be the council's preferred vice. A decade and a half into the 21st century, City Hall is finally catching up with the late 20th century by using new technologies to make its operations run smoother. Contractors can now bid for proposals online instead of on paper. Public computers in the library are getting enough bandwidth -- up to 100 megabits per second -- so that people can easily use them for research projects, school work or job applications. And in separate pilot projects, the city is installing "smart" technologies into street lamps and high-tech trashcans, capable of providing information on topics ranging from traffic problems to when garbage needs to be picked up.